We know his real name, but we still don't know what he was hiding from. CLEVELAND -- Phillip Nichols can still visualize that shiny new 1964 Ford Falcon convertible, the same one his father drove into a new life. It was one of the last times he saw his father, one of the last times anyone heard of Robert Ivan Nichols. The internet had fun playing detective games at his father’s expense. Even now, suggesting that Nichols, for some unexplained reason, went to extreme measures to steal a new name to mask his identity as the Zodiac Killer. “I can’t control what people think,” his son said. This all started not long after an aging man with oversized eyeglasses and a hair-piece pressed the barrel of a .38 caliber revolver into his jaw and squeezed the trigger. It was an open and shut suicide. We now know Joseph Newton Chandler III didn’t die that day in 2002. He actually died in 1945 at age 8. Instead, the decaying body in a tiny Eastlake apartment was really Phillip Nichols’ dad. 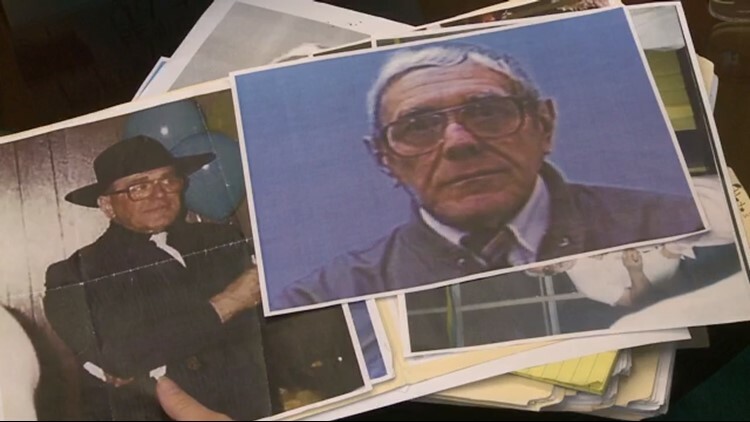 RELATED | With his true identity revealed, what was Robert Nichols hiding? Robert Nichols grew up in southern Indiana, near the Kentucky border. Smart, but introverted, he served in the Navy during World War II. He was aboard the U.S.S. Aaron Ward anchored near Okinawa when at least six Japanese Kamikaze pilots bombed the minelayer on May 3, 1945. The attack killed 42 of Nichols’ shipmates. It was a horrific scene of mangled body parts. One blast killed a man two feet from Nichols. When the smoke cleared, Nichols looked down and saw only his shipmate's boots. Nichols was left severely burned, suffered injuries from shrapnel, and later received the Purple Heart. Relatives recall Nichols returning home and later burning his uniform. He rarely spoke of his military service. "Zero. Nothing whatsoever about the war to us," his son said. Many now believe the war left him with post-traumatic stress disorder. Shortly afterward, he married his wife, Laverne, and they had three sons: Phillip, Charles and David. They lived near Louisville, Ky. Robert worked a white-collar job with General Electric. Robert wasn’t the perfect dad. He wasn’t affectionate. Not with his sons, not even, it seemed with his wife. He was a devout Baptist, but not very social. He was smart and frugal. Looking back, Phillip and others wonder if his father may have had autism or Asperger’s. When Phillip was 16, his parents divorced. “I never noticed an issue in the marriage until the end, and then I could tell there was distance growing between the two of them,” Phillip said. His memories of life with father are few. A ballgame or a pro wrestling match. Some camping trips. He especially remembers attending a Billy Graham crusade. It was one of the few hugs he had with his father. “I can remember him hugging me and that in and of itself was unusual. I can’t recall him hugging me or anyone else for that matter," he recalled. Still, to Phillip, it felt like his mother urged her isolated husband to try and bond with his sons. He does remember that Ford Falcon. His father packed up that new car and headed north to Dearborn, Mich. He took on an engineering job, helping to design modern cooling systems for race cars. That was 1965. Phillip and his brothers visited their father once. And that was the last Phillip heard from his dad. “He seemed happy with whatever was going on there,” he said. “But I have no idea why he went to Dearborn. That was his decision." He does remember the financial ruin his mother endured. Phillip and his brother Charles took on jobs to help their mother. They both later enlisted in the military. Dad was nowhere to be found and neither was the child support. To Phillip, that was the motive for disappearing. “Of course, it would be pure speculation, but I think it’s the child support, not so much why he left, but why he disappeared,” he said. “Dad was a law-abiding citizen during the time that I knew him. He never had any kind of problems like that. Laverne Nichols worked as a nurse’s aide to make ends meet. Three years after her divorce, she remarried and lived a happy life filled with 10 grandchildren. She never spoke of her former husband. It just wasn’t discussed, Phillip said. “He’s never seen his grandchildren. I feel bad about that,” he said. Nichols worked his way westward in the late 60s, landing near Richmond, Calif. That is the tie that causes some to speculate his possible role as Zodiac. A blank slate exists for about 10 years. In 1978, from Rapid City, SD, he mailed away for Chandler’s birth certificate. He became the dead boy and headed for Cleveland that same year. He later moved to Eastlake where he became everyone’s peculiar neighbor and co-worker. He lived a Spartan-like life. One dish, one set of utensils. He created gadgets. Rarely socialized. When he died, he had $82,000 in the bank. Lawyers spent most of it trying to find his next of kin. It took DNA and 16 years to unravel the mystery. And now, more questions remain. Why? And what was he running from?